IT’S MY FIRST RECIPE OF 2016!!!!!!!! I am more excited for 2016 than I am for 2015 both personally and professionally, which is crazy, because I married the love of my life in 2015 (here, here and here) and I’m not sure how I’ll be topping that. I’m most excited for 2016, because I’m finally at a point in my business and my life where I feel in control and like the changes and progress I want to make are attainable. I have so many great things coming your way this year, and I can’t wait to make it all happen. 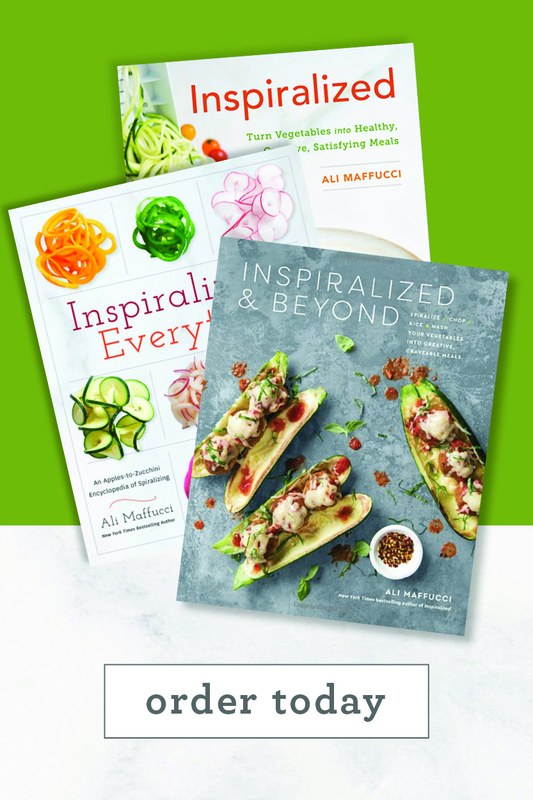 Most immediately, I’m going to be launching a #30daysinspiralized meal plan challenge on January 15th. 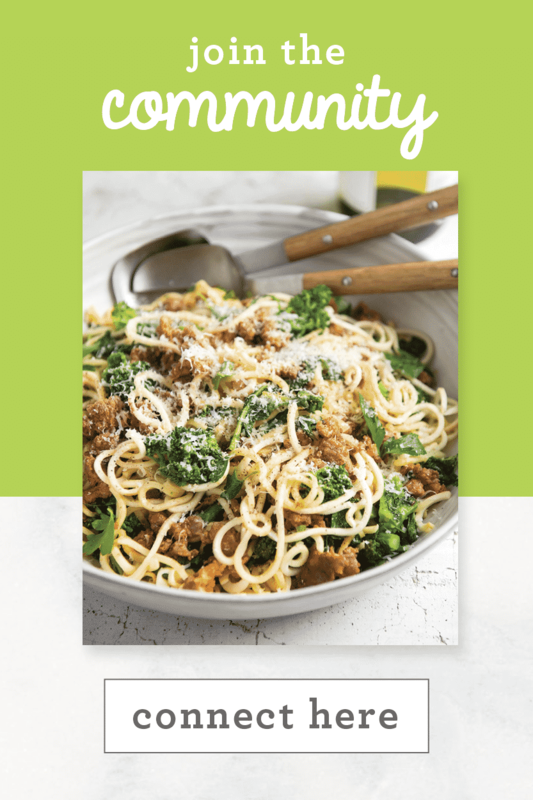 This “challenge” is a 30 day meal plan, entirely spiralized. 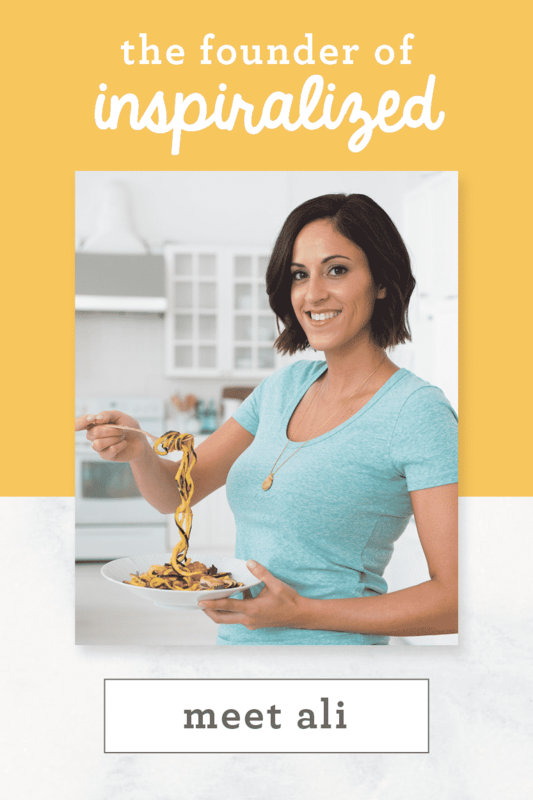 The PDF will include weekly meal plans for lunch and dinner (after all, that’s what we struggle most with when meal planning), detailed shopping lists and a full instructional video and printable guide on how to meal prep everything, each week. The price? $9.99, BUT on January 15th, it’ll be $7.99. 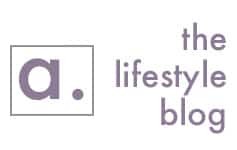 To make sure you don’t miss the promotional price, make sure you’re subscribed to our newsletter. And that’s just in January! There’s so much more to come! But today, it’s all about my mom’s chicken. My mother makes a chicken that’s so juicy and flavorful, and I finally made it with her while I was in Florida over the holidays. And guess what: it’s SO simple! I was shocked, I figured it was painstakingly laborious. The trick: find a healthy bottled teriyaki sauce. My mother lays out various vegetables (celery, carrots, onions, etc) and places bone-in chicken breasts on top. Then, she pours over a bit of Worcestershire sauce, soy sauce and a bottled teriyaki sauce. 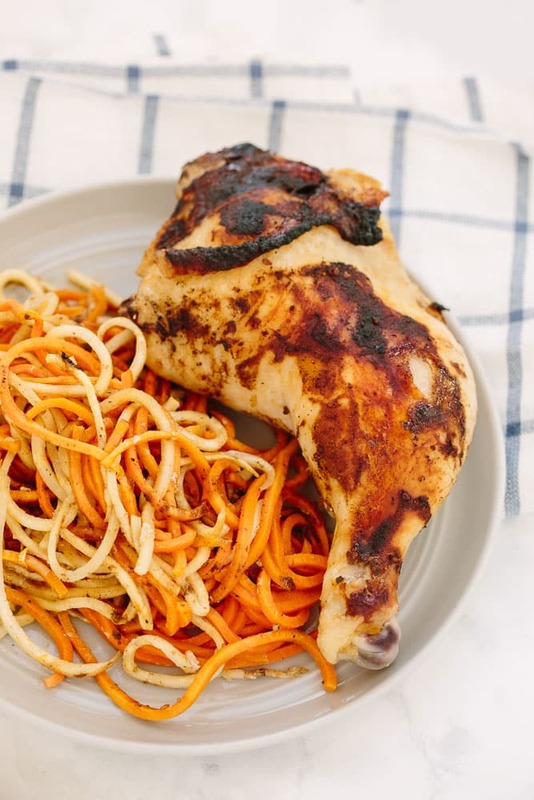 She bakes it for 1 hour at 400 degrees F and voila – THE BEST CHICKEN, EVER. If you’ve been looking all over for a healthy teriyaki sauce, I really recommend Tessemae’s (it’s gluten-free and clean-eating friendly.) I recently posted something on Instagram about meal planning and a lot of you commented with, “easy, simple ingredients that I won’t use once and then never again.” I totally understand this, BUT, I really encourage you all to stock your pantry with essentials like sesame oil, spices, soy sauce and other condiments that will enable you to easily and quickly whip up a healthy dish. Maybe you should add “stocking the pantry” to your 2016 to-do lists! 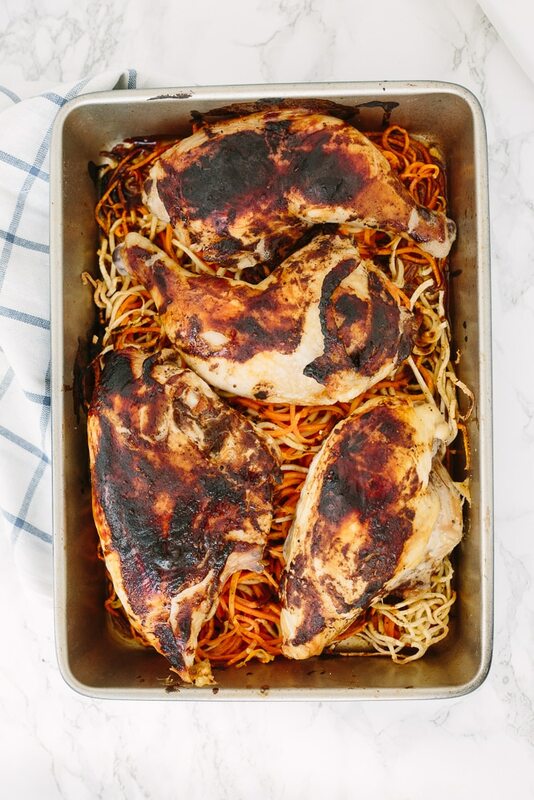 With this chicken dish, I’ve used spiralized sweet potatoes and parsnips instead of cubed vegetables (like my mother does), because, this is Inspiralized.com! 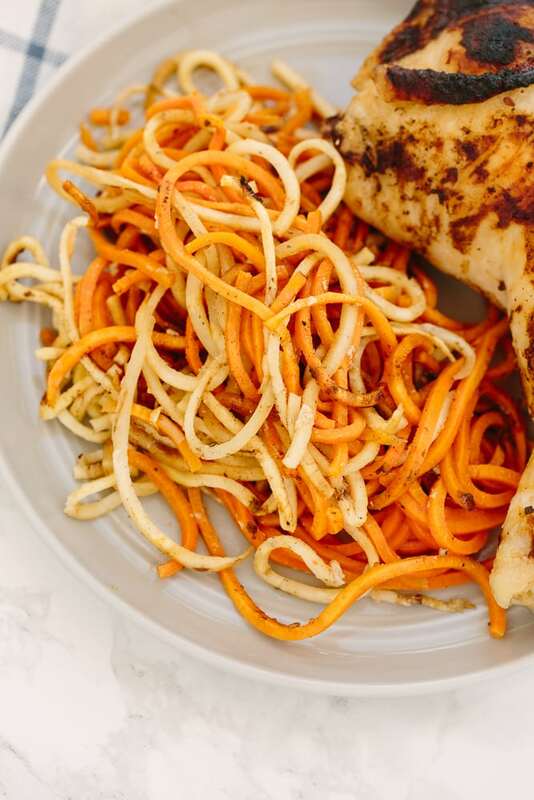 Ha, but really – these spiralized veggies absorb the moisture and juices from the chicken, creating a delicious sauce. If you have celery root, rutabaga or other fun root vegetables in your fridge, toss ’em in! This dish is meant to be easily adaptable to your preferences. So, welcome to 2016 – I hope it’s filled with a lot more spiralizing!! And, thanks to my mother for the recipe! Toss together all of the spiralized vegetables with 1 tablespoon of olive oil and season with salt and pepper. Take out a large baking dish and add in all of the spiralized vegetables. Then, top with the chicken, laying out in one even layer. Season the tops of the chicken with salt and pepper. Drizzle the tops of the chicken each with 1 tablespoon of the teriyaki sauce, 1/2 teaspoon each of the Worcestershire sauce and 1/2 teaspoon each with the soy sauce and spread with a brush until the tops and sides of the chicken are covered. Bake in the oven for 45 minutes to an hour or until chicken is no longer pink on the thickest part of the chicken. If at 45 minutes the tops of the chicken and burning and not yet fully done, cover with tinfoil and bake for another 10-15 minutes. 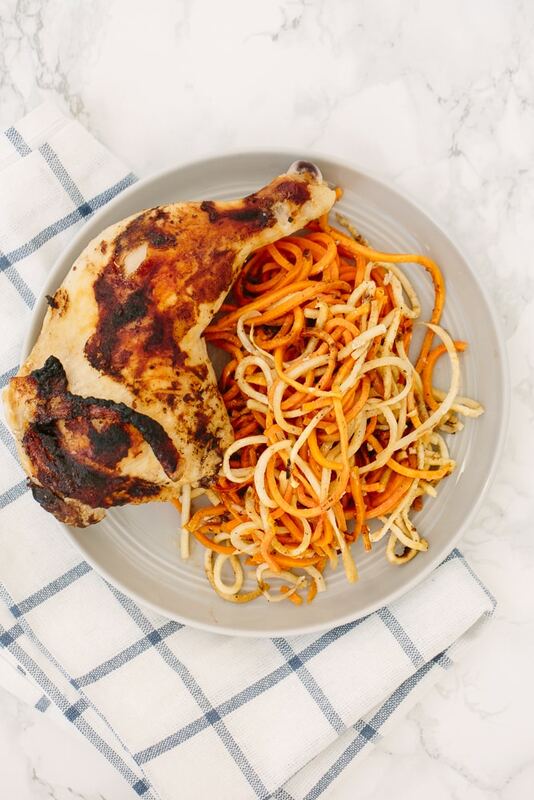 Remove from the oven and serve a scoop of the spiralized vegetables along with a piece of the chicken. Hi Ali! Just to warn you that I believe you made a mistake when writing the first paragraph " because I married the love of my life in 2016" :) Happy New Year and keep up with the good work! Seems like you're determined to marry him in 2016! This is officially added to my Inspiralizer recipes to try! It looks so good! Also, I can't wait for the meal plan! 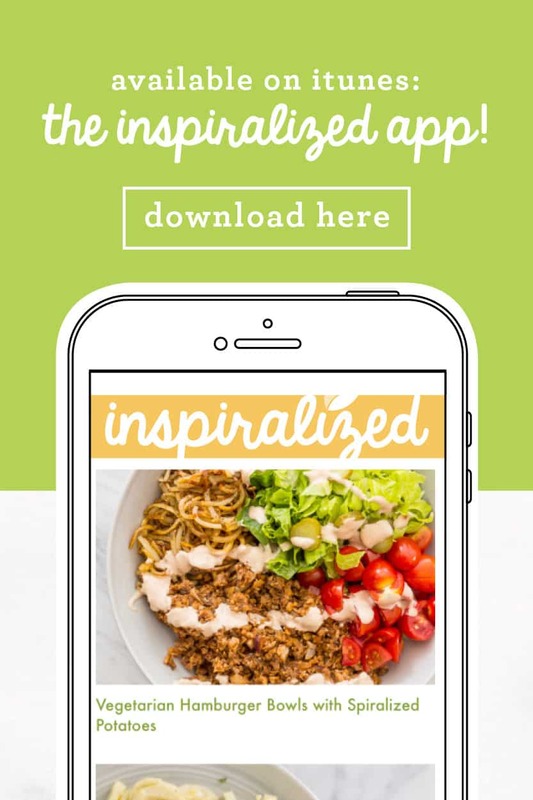 I got my Inspiralizer during your Black Friday sale and I absolutely love it! Thank you for another easy, delicious looking recipe. And thanks to your mom! Happy New Year Ali! Looking forward to a new year of enjoying all your great content and all the new things you have coming your reader's way! Hi Ali, This looks awesome. Did you leave the skin on the chicken when you baked it? Thanks for all you do! I originally gravitated towards this for the recipe which looks fantastic. I'm definitely looking forward to making it. Got sidetracked by the wedding pictures, however, and am just delighted. Talk about the perfect wedding! Best of all thebride and groom looked to be enjoying it as much, if not more, than their guests. So glad you re-shared! Looks delicious! Would it be possible to substitute boneless skinless chicken breasts? If so, would you advise cooking it for the same amount of time? Yes, you can definitely do that but I find they're more flavorful and much juicier, thanks to the bones! I would try to cook for 25-30 minutes only! Ali, can we sub coconut aminos for the soy sauce? Yay!! I'm cannot wait to purchase your meal planning kit!!! That is my biggest hurdle in my fit journey. I'm also looking forward to buying a reusable shopping tote from you :-) when will that be available for purchase? Happy 2016! This looks great- going to try to adapt it to the slow cooker this week! This recipe looks delicious and I will definitely try it. Also, I want to thank you for introducing me to Tessamae's products, when you recommended their BBQ sauce a while back. It wasn't carried in stores in my area, but their salad dressings were and I am hooked on them, especially the Lemon Garlic. (Sorry, I'm lazy about making my own.) I would try anything they make! It wouldn't sit on my shelf long. This is fabulous to hear, Karen! They make some great stuff. What do I do with the rest of the sauces that are not used for basting the chicken before putting it in the oven? (recipe calls for 4 Tbs teriyaki, 2 tsp Worcestershire, and 2 tsp Soy, but only utilizes 1 Tbs teriyaki, 1/2 tsp Worcestershire, and 1/2 tsp soy.) Thanks for your help. This looks very tasty. Joan - that's PER chicken piece, so if you add it all together, it adds up to 4 tbs teriyaki, etc.... Hope that helps! Oh. How silly of me. I read, & re-read the recipe, & still couldn't figure it out. Guess I need to brush up on my reading skills. Thank you so much for your prompt reply. I am going to make this tomorrow night for supper. Hi Ali! 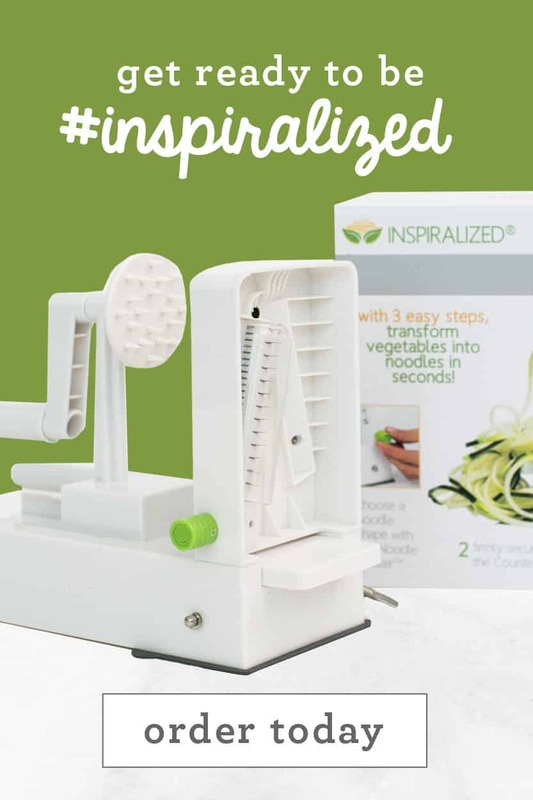 I'm totally hooked on your website and products after receiving the spiralizer for Christmas. I've literally used it everyday and have since ordered your cookbook and will definitely sign up for your upcoming 30 day program. On this recipe, I already have bone/skin thighs and drumsticks. Can I use all the same measurements and cooking times? Another yummy recipe to try! I love roast chicken! My mom used to make one that was just cut up chicken with sliced onions and a bit of butter on each chicken piece, along with salt and pepper. So good! I think this one will rank right up there with mom's! Looking forward to trying it! Hi Ali I purchased my spiralizer this fall and was having a devil of a time using it on my tile counter tops. So I put it away. We upgraded our counters to Quartz over the holidays. So I decided to give it ago again. Wow what a difference, the suction cups worked great on the new counter. I made Chicken Pammesan with zucchini noodles and the whole family loved. I made your apple tuna salad for lunch today. And will try this chicken dinner recipe next. So happy to hear this - and sorry for the initial inconvenience, what a bummer! Awesome dish Ali!! Everyone in the family loved this! Also made the Jicama soup. Forgot to add the black bean, no one noticed! Really enjoying the recipes. All the best. 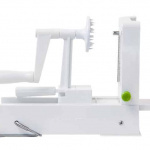 You must forgive me for having purchased Kitchen Aid Spiralizer prior to knowing of you and your site. I'm enjoying your posts and look forward to cooking your recipes. Best wishes on your recent marriage as well! As long as you're spiralizing, I'm happy!! Thank you so much! I made something similar last night, but roasted beets, butternut squash, and sweet potatoes. 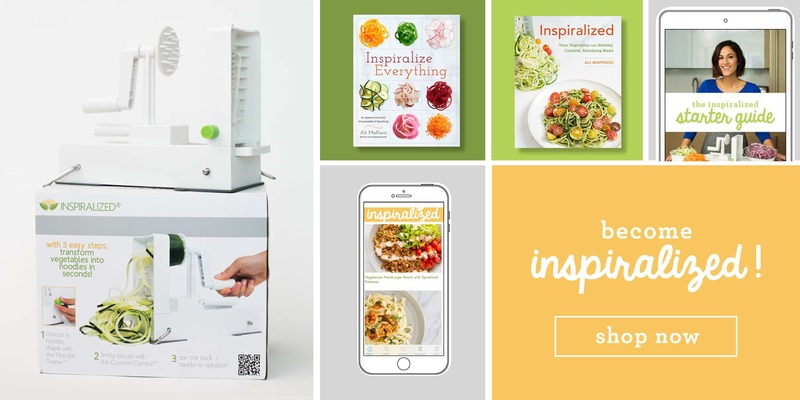 I just got my inspiralizer for Christmas and love it. But I was not able to spiralize the squash or sweet potatoe. I've watched the how to videos, but I guess the veggies were too tough? Also, the straight cutting blade bowed out and the sweet potatoe bits got stuck between the blade and plastic. Any tips? Hi Jinger!! This sounds like a possible defect with your Inspiralizer. You should have no problems spiralizing those tougher veggies. I'm very sorry about that. 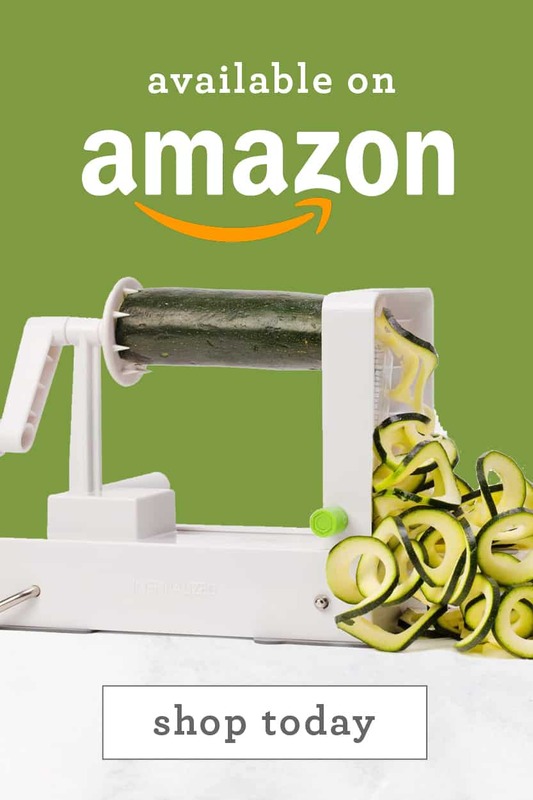 Please email me: [email protected] and I'll help you get back to spiralizing! This is definitely a ⭐️⭐️⭐️⭐️⭐️ recipe! I followed it exactly, except for substituting butternut squash for the sweet potato and using boneless, skinless chicken thighs. So simple, tender and delicious! Baked for 45 minutes uncovered, then 15 more minutes covered with foil. This will become a winter favorite in my house. Thank you, Ali! We're so happy to hear that you loved this recipe, Nita! Sounds like a total hit. Looks good but the sodium is off the charts - ouch! It's soon easy to make your own teriyaki sauce. THIS WAS SO GOOD. So easy and so much better than I expected. That's all :) Thank you!! Made this for dinner tonight! My grocery store didn't have skin/bone in chicken breasts, so I seared the chicken before baking. It cut the total cook time down and was still delicious!! Can't wait to share this recipe.